A home’s rain gutters play an essential role in prevention and protection. Rainwater can cause numerous costly and expensive home issues if a correctly installed and maintained rain gutter system is not in place. If gutters and downspouts become clogged with leaves or debris, the gutters will overflow and eventually compromise the integrity of the rain gutters. 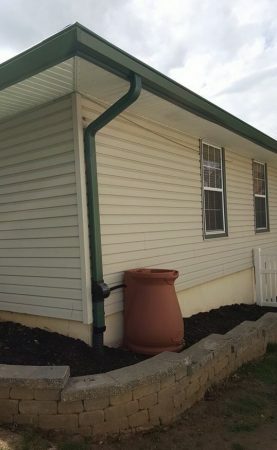 Having an efficient rain gutter system in place has many benefits regarding water drainage, preventing gutter leaks, avoiding foundation problems, basement flooding, preventing erosion and damage to siding, and water staining. What Are K-Guard Leaf-Free Gutter Guards? When it comes time to replace your current gutters, or if you are merely looking for a maintenance-free option, consider the benefits of having an entire gutter system like K-Guard leaf-free gutter guards professionally installed. The K-Guard system boasts a superior product that is secured by their patented, all-weather, and highly-durable polymer hangers. The K-Guard gutter system uses patented technology to keep your gutters free of leaves and debris, keeping your home protected and looking its best. What Are the Advantages of the K-Guard Gutter System Compared to Conventional Gutters? K-Guard gutters are a “full system” because they include the gutter and hood. There are other benefits to choosing K-Guard over competitors. The K-Guard leaf-free system is a five-inch gutter system, while most competitor gutters are designed for three- and four-inch gutters. The K-Guard system attaches directly and securely to the rafter tails and fascia board; competitor products are connected to under the roof’s shingles, which can lead to potential roof warranty issues. K-Guard has a rear-drainage channel providing water with two paths of entering the gutter system. Many competitors do not have this option as water blown by wind ends up under the roof shingles, causing damage and reducing the lifespan of a roof’s shingles, especially those closest to the gutters. K-Guard gutter systems are designed to fit correctly on the home. The system does not touch or interfere with the home’s roofline. Competitor products are built to fit onto existing gutter systems and do not take into account the roof design. When it comes to appearance, the K-Guard leaf-free gutter system is far superior as it has a smooth face that mimics the appearance of molding, rather than alternative products that often look bulky and do not flow with the rest of the home’s exterior. The K-Guard gutter and hood are the same color, and there are a variety of colors available to match the aesthetics of your home. This element allows your gutter system to add to the look of your home instead of sticking out like a sore thumb. When it comes to the end-goal of preventing gutter leaks, adding an entirely new water-drainage structure like the K-Guard system is the way to go. Other gutters that do not provide a complete system, but instead add to existing ones will only work for a period, if at all. If you are looking for a complete gutter water-drainage system that will remove the necessity of maintenance and the cost of hiring someone to do so, the K-Guard leaf-free gutter guard system is the best course of action for homeowners. Find a dealer near you to schedule a free estimate.